With Spring sunshine tinting London with its energy, the Archive is all set for new projects over the next few months. As we take stock of recent acquisitions, we realise it’s over a year since we shared some of the things that have been added to the shelves here, so there’s much to catch up on! The handsome Beardless Warriors / Brothers in Arms set arrived on our doorstep from Gauntlet Press just this week, bearing Clive’s cover art on the second volume, and over past months we’ve seen an ever increasing number of publishers with local language editions of the Shining in the Dark anthology, containing Pidgin and Theresa. Cemetery Dance also produced a chapbook of artwork by Erin S. Wells, inspired by the stories of the anthology. Non-fiction additions include Jon Towlson’s take on Candyman (including an interview with Bernard Rose), ESC / Bragelonne’s Hellbound Heart translation which includes an interview between Clive and Pete Atkins and accompanied its release of Hellraisers 1-3 on Blu-Ray, and Manchester University Press offers a collection of pieces focussed on various aspects of Clive’s work edited by Sorcha Ní Fhlainn. But it’s often some of the older, ephemeral things that become uncovered - often with thanks to friends of the Archive - that are most unusual: as Hellraiser debuted on VHS rental in 1988, New World produced a promotional standee featuring the box office data from The Hollywood Reporter on the back; and a set of Murray Close’s black and white contact sheets for Hellbound has happily found its way to the Archive some thirty years after they were created. Promo VHSs for Gods and Monsters and Lord of Illusions sit next to a much more recent DVD release of Chilling Adventures of Sabrina, which features Clive’s art on the walls of the Academy of Unseen Arts throughout, and the new Blu-ray release of Candyman. 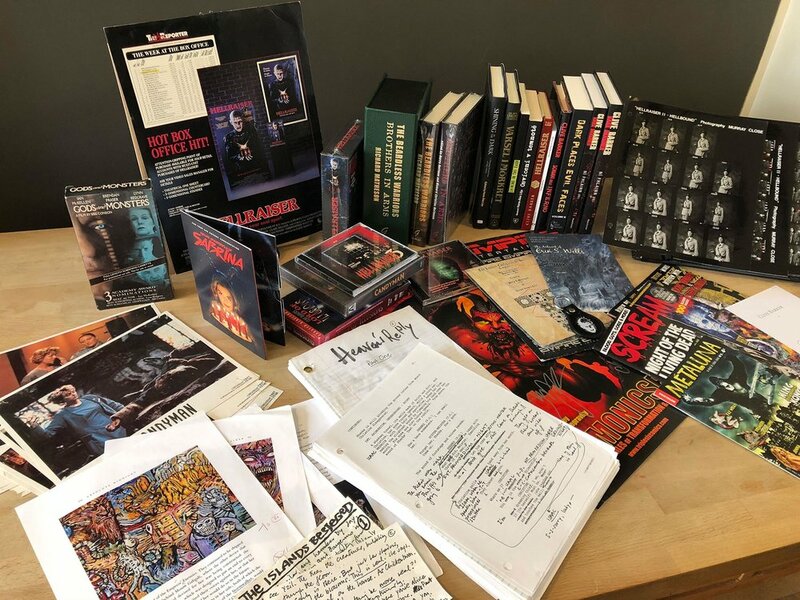 Of course, Clive’s own notes and working papers form the backbone of the Archive and his manuscript of Heaven’s Reply and a hand-amended Tortured Souls screenplay are new additions. The growing complexity of the Abarat plot demanded that, whilst writing the third volume, Clive kept a firm track of characters and places by creating a pinboard of index cards, each one devoted to a plot point - these two cards were recently rescued from a water-damaged storage area deep under his library. Once dried off, they could be safely added to others in the Abarat papers, together with the proofreader’s marked up pages for Absolute Midnight. More news on upcoming projects to follow! Hopefully you’ll have received our recent newsletter which carries the news that Clive has personally selected a number of pieces to be made available for sale through the Archive store. The first selection is a collection of 21 studio sketches which are now available. These sketches offer a direct insight into Clive's development of characters for Abarat, Deep Hill and other ongoing projects. Own an original piece for your walls! All pieces are signed by Clive and come with a certificate of provenance from The Clive Barker Archive. Sign up to the Archive newsletter here to make sure you always get the earliest news of Archive publications and additions to the store! We're delighted to say that copies of Imaginer 5 are now shipping out to their new owners! Many thanks to everyone who has placed a pre-order for this fifth volume of Clive's artwork. Over the next few days we'll be sending out fulfilment emails as we package and ship them from London and Los Angeles. Many of the deluxe copies are already on their way and the regular editions will be hard on their heels, so do please check your inbox for a tracking notification!